Anne-Sophie Mutter performed the Berg and Moret's "En Rêve" with the New World Symphony. New York Times: "It was an inspiring statement, as well as a smart artistic choice." 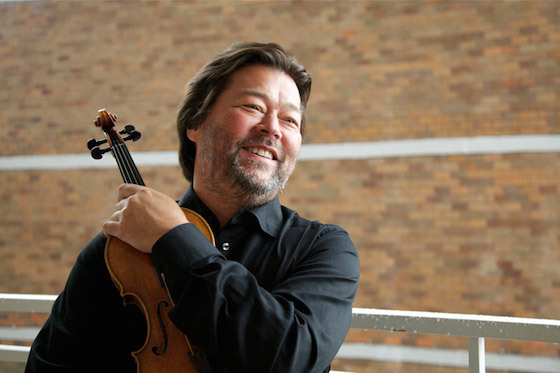 New York Classical Review: "The pleasure of hearing this tremendous musician play two of the finest violin concertos of the 20th century was equalled by the pleasure of hearing Tilson Thomas’ great orchestra. Mutter’s artistry is peerless, and hearing her in person constantly impresses how fine and rare is her musicianship." Joseph Swenson. Photo by Jack Dine. Joseph Swensen performed the Barber with the Scottish Chamber Orchestra. The Arts Desk: "...for the most part this was a performance carefully rehearsed and beautifully executed. It was tightly controlled, yet within Swensen’s structure there was room for spontaneity and lyricism." Herald Scotland: "... the City Hall was bathed in the Romantic warmth and open-hearted honesty of Swensen's gorgeous playing of Samuel Barber's luxurious Violin Concerto; and, for the record, I have never heard an account of the racing finale which so took my breath away, all without cornering on two wheels." Baiba Skride performed Bartók's Violin Concerto No 2 with the London Symphony Orchestra. The Guardian: "A passionate, heart-on-sleeve player, she attacked the opening with such richness of tone that her Stradivarius sounded more like a viola than a violin. The subsequent swerves between lyricism and aggression were superbly negotiated." Yuliya Smead performed the Bruch with the Fox Valley Symphony Orchestra. WeAreGreebnBay.com: "Her playing neared the pristine." Sarah Chang performed the Dvorak with the Auckland Philharmonia. Stuff Nation: "While we saw and heard flashes of brilliance and Chang's trademark clarity throughout the performance, something seemed out of place. Chang's body language on stage seemed to indicate discomfort with something, particularly in the first movement." The New Zealand Herald: "Last week, in an interview, the American violinist justified her obsession with haute couture as a desire for the audience to feast with eyes as well as ears. While a glittering Roberto Cavalli gown certainly delivered ritzy visual pleasure, what we heard was too often the equivalent of a rough and ready takeaway." I love reading these reviews, not only to see who is around and what they are playing but also to get an occasional insight into music and performing. On the wholethough, I have to say that even the best critics these days say very little, often in an extremely murky and un informative way. 'Her performance was almost pristine ' leaves me none the wiser and the antipodian section seems more inclined to verbal di-a- rea and quasi sexism. I will always wonder what this body discomfort was. Even the greats have indigestion or dare one say menstrual cramps. Perhaps it was because of a rough and ready New Zealand takeout? People really get paid to say so little!Probably correlates with an overall decline in both journalism and literacy. And these are the best quotes I can find in each review. Sigh. Sometimes there are brilliant, wonderful reviews, written with insight and care. But not always. If anyone has a link to such a review, please forward them to me! I really do welcome those links each week; certainly the best reviews are not always in mainstream publications. What could they say? He played it slightly differently than the last 350 recorded performances? Modern violin playing is just a compendium of cliches that go over well at contests. No one in the audience knows any better. they don't even know who played the last thing they heard. All I know is I get tired of reading puffed up reviews of "peerless performances". I just went to a performance last weekend where I thought the soloist had a muddy, crushed tone, frequently got drowned in the orchestra, and was out of sync a fair amount, but due to some incredible dance moves, got quite the standing ovation from the audience. Of course, maybe it's just that I was one of the only haters still sitting, but the one review I found mentioned none of this stuff. It's like a lot of the reviews I read are written off a MadLibs template. Still, I do hope Mutter comes to Denver soon.